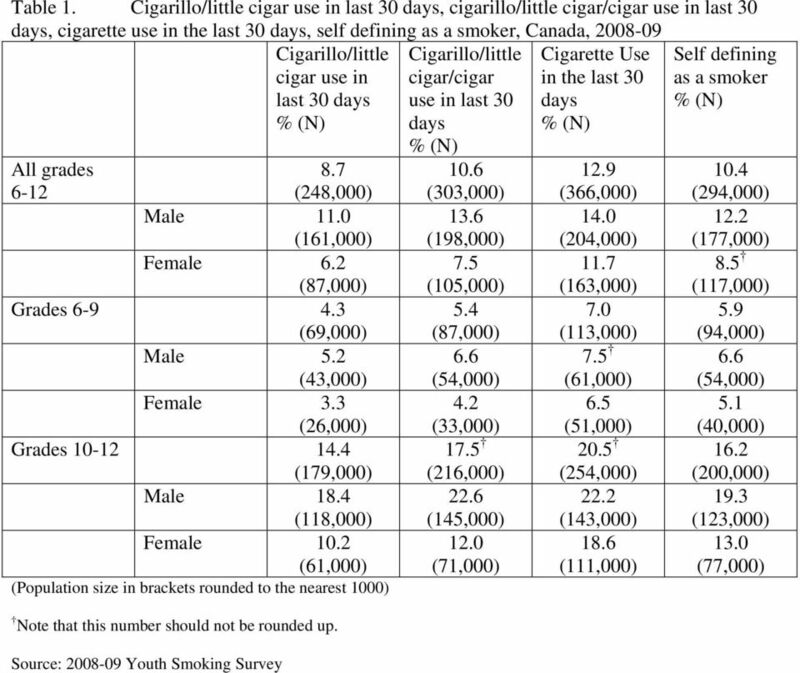 Download "Additional Tables, Youth Smoking Survey 2008-09"
4 Table 3. 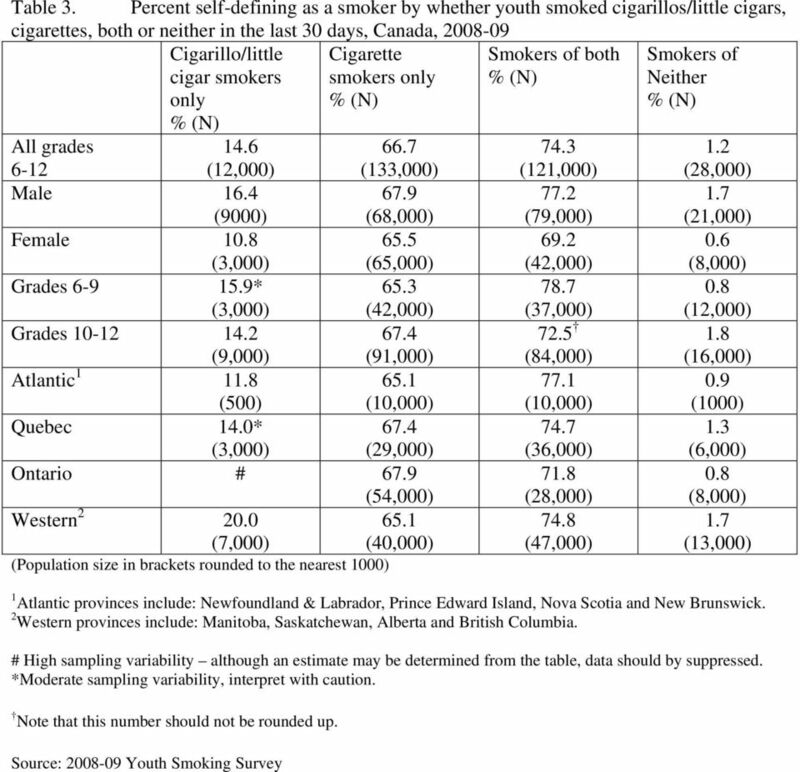 Percent self-defining as a smoker by whether youth smoked cigarillos/little cigars, cigarettes, both or neither in the last 30 days, Canada, cigar smokers Cigarette smokers Smokers of both Smokers of Neither All grades (12,000) 66.7 (133,000) 74.3 (121,000) 1.2 (28,000) Male 16.4 (9000) 67.9 (68,000) 77.2 (79,000) 1.7 (21,000) Female 10.8 (3,000) 65.5 (65,000) 69.2 (42,000) 0.6 (8,000) Grades * (3,000) 65.3 (42,000) 78.7 (37,000) 0.8 (12,000) Grades (9,000) 67.4 (91,000) 72.5 (84,000) 1.8 (16,000) Atlantic (500) 65.1 (10,000) 77.1 (10,000) 0.9 (1000) Quebec 14.0* (3,000) 67.4 (29,000) 74.7 (36,000) 1.3 (6,000) Ontario # (54,000) Western (7,000) (40,000) (28,000) 74.8 (47,000) (8,000) 1.7 (13,000) 1 Atlantic provinces include: Newfoundland & Labrador, Prince Edward Island, Nova Scotia and New Brunswick. 2 Western provinces include: Manitoba, Saskatchewan, Alberta and British Columbia. # High sampling variability although an estimate may be determined from the table, data should by suppressed. *Moderate sampling variability, interpret with caution. 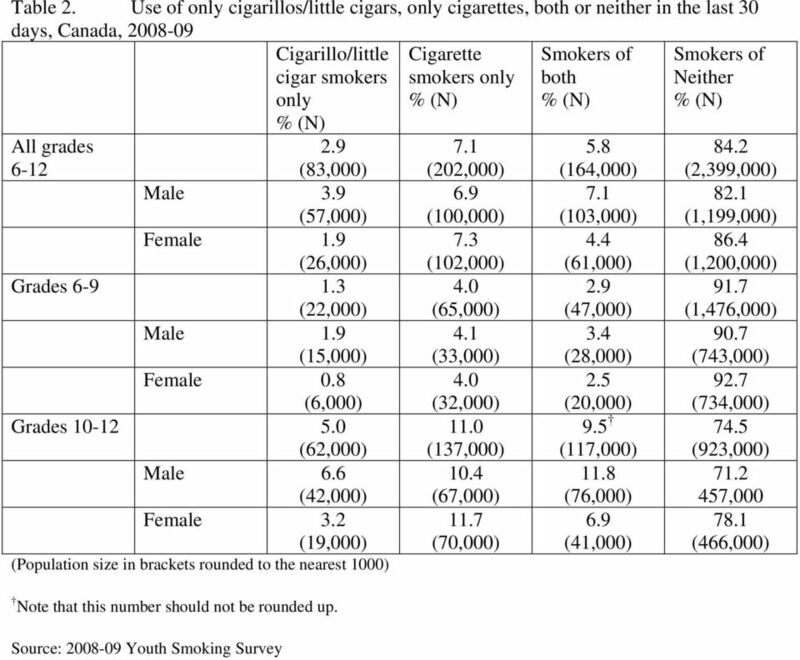 5 Table cigar smokers Cigarette smokers Source of tobacco 1 by cigarillo/little cigar and cigarette smoking status, Canada, Retail Sources (23,000) Social Sources/Sharing (59,000) 31.1 (49,000) 68.9 (108,000) Smokers of both (32,000) (69,000) Cigarillos/little cigars from retail sources, Cigarettes from social sources 10.0 (13,000) Cigarillos/little cigars from social sources, Cigarettes from retail sources 10.2 (13,000) 1 Refers to source of cigarillos/little cigars in the last 30 days and usual source of cigarettes. 2 Retail sources include they buy them from store. 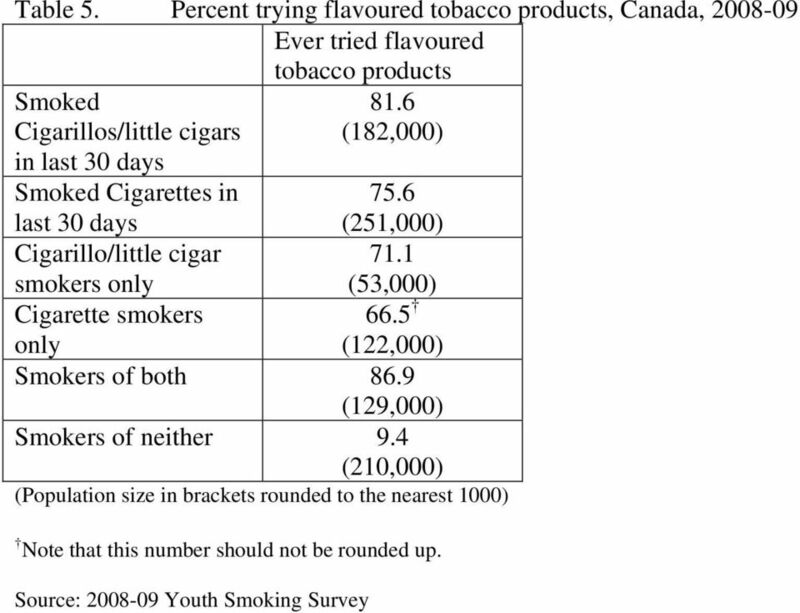 3 Social sources for cigarillos / little cigars include buying from brother/sister/friend/someone else / ask someone to buy them / those who stated that they did not buy cigarillos/little cigars in the last 30 days and had smoked cigarillos/little cigars in the last 30 days. 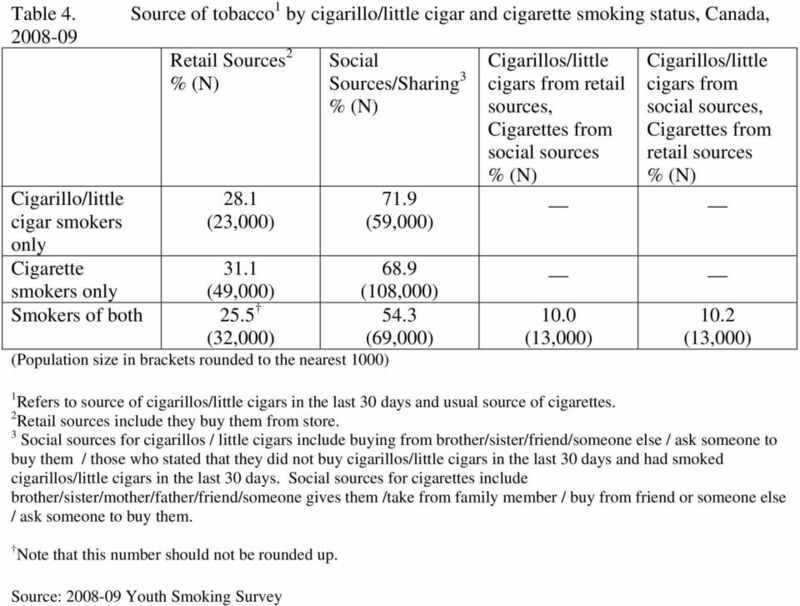 Social sources for cigarettes include brother/sister/mother/father/friend/someone gives them /take from family member / buy from friend or someone else / ask someone to buy them. Canada Product Guide. With our Accelerator Program of insured A products we now have bank rate options for your A clients with clean credit. Open Government and Information Management. Roy Wiseman Executive Director, MISA/ASIM Canada CIO (Retired), Region of Peel roy.wiseman@outlook. Working with a financial adviser Canadian Securities Administrators Securities regulators from each province and territory have teamed up to form the Canadian Securities Administrators, or CSA for short. Report September, 2008 How Many is Too Many?